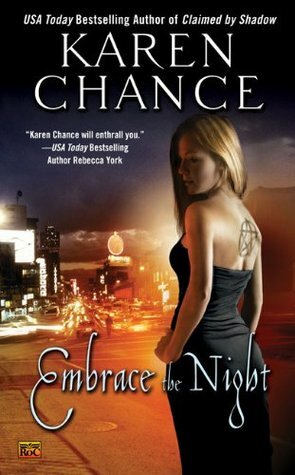 Embrace the Night by Karen Chance - WARNING! I cannot talk about this book without spoiling the first two. Do not read if you plan on reading Touch the Dark and Claimed by Shadow! Cassie Palmer, now Pythia – cheif clairvoyant, has come into her full power. Having not been trained as a candidate for Pythia when she was growing up, she’s struggling to understand here powers and work out how to use them. Working things out will have to wait however, as she needs to get hold of the Merlini Codex. The geis between her and Lord Mircea, a master vampire and member of the vampire senate, is getting stronger, and Mircea’s life is at risk. Only in the Codex can she find the counter spell to the geis and free them both, with the help of the war mage Pritkin. With a group of runaway magical children who are dropped on to her plate, and the continual attempts on her life by the Silver Circle, things are complicated. But then she starts to mistrust Pritkin, and when a blast from his past shows up, the truth about him is revealed, and things start to get a lot worse. I don’t know how Karen Chance manages to do it, but this book is amazing! You may remember that I wasn’t all that keen on the first book because of the way the world building was dealt with. There is no problem now! This book was just awesome! It’s unbelievable how fast paced it is, and how everything links together even though there are so many things going on at once. I love it! Along with Cassie, you’re not sure who to trust and who to mistrust, who wants to help and who is out for themselves. You’re kept guessing the whole time! You may also remember that I didn’t like Pritkin in the first book. I absolutely bloody love him now! He has to be my favourite character; he’s always angry and untrusting, but he’s just so cool with his spells and weapons, and how you can rely on him to get you out of a scrap. If he’s not my favourite, then possibly Billy Joe, Cassie’s ghost sidekick, or Casanova, the vampire incubus, or incubus vampire (I always get that confused) who run’s night club Dante’s. Cassie is amazing though. She goes through a rollercoaster of emotions through this novel as the story progresses as she gets more information, meets another obstacle, or other complications arise. She keeps at it though, she picks herself up and tries again and again, and her strength is admirable. Even when things seem impossible, and she’s at her wits end, the girl doesn’t stop. I can’t really go into too much more detail without spoiling the book. It has Chance’s usual fast pace, array of strong, but humorous character, and a plot that’ll keep you turning the pages into well into the night! If vampires, weres, fey, witches, mages, clairvoyants and demons are your thing, this is a series you definitely need to grab!